Florida has about 1.3 million alligators that live in all 67 counties. They live in wetlands, vital habitats that contribute to their survival. But alligators also play an important role in keeping their habitats healthy. They keep the garfish in check saving bass and bream and other game fish. They help control the number of rodents and other animals that might overtax the marsh land vegetation. But their most important contribution is the gator holes it forms. The alligator wallows out a depression that stays full of water in the wet season and holds water after the rains stop. During the dry season and during extended droughts the gator holes provide vital water for fish, insects, crustaceans, snakes, turtles, birds, and other animals in addition to the alligator itself. Almost fifty years ago, alligators were depleted in the U.S. due to market hunting and habitat loss. In a combined effort by the U.S. Fish and Wildlife Service and State wildlife agencies in the South the animals were saved. The Endangered Species Act prohibited alligator hunting allowing the species to rebound in numbers. 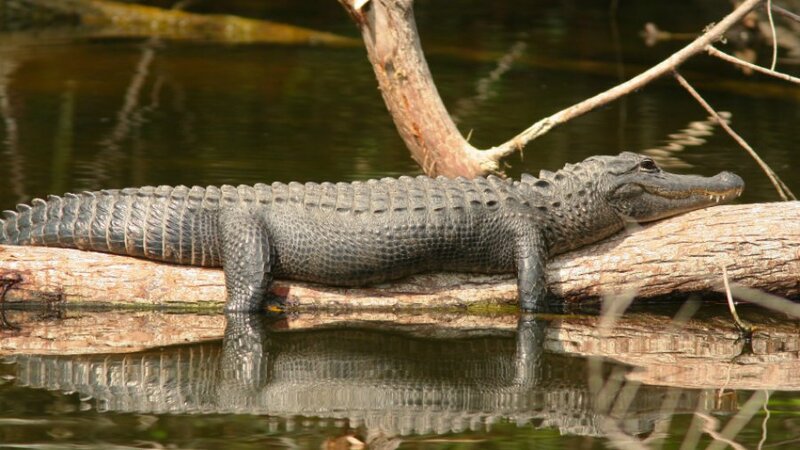 In 1987, the Fish and Wildlife Service pronounced the American alligator fully recovered and removed the animal from the list of endangered species. The alligator population in Florida is doing well except in the Everglades which is concerning to marine biologists, researchers and environmentalists. Their concern began years ago when scientists started noticing that the alligators in South Florida were smaller than those found in central and north Florida. Their habitat was also supporting only half the population expected could support such an environment. In an article by Craig Pittman in the Tampa Bay Times, biologist Frank Mazzotti, a University of Florida professor said that alligators have been called “the buffalo of the Everglades,” if they are not doing well than neither is the Everglades. He believes the problem is the water, not the pollution, but the quantity of it. Mazzotti also attributes the problem to the Army Corp of Engineers building a series of canals, levees and pumps that altered the natural flow of water. It “disrupted the natural wet and dry pattern of the Everglades.” This was bad for alligators because it disrupted the normal pattern for the fish that they usually eat, “making it more difficult for them to find their food. Mazzotti said the alligators are without sufficient food and that affects both their body size and their population. The Everglades restoration project was approved by Congress and the Florida Legislature in 2000. One of its goals was to restore the historic ebb and flow pattern of the Everglades which could help the alligator population. But the project is years behind and costs have ballooned.